Dr. Nephi Riordan has been in practice since 1995. 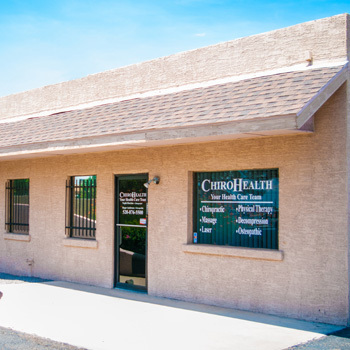 ChiroHealth opened in 2001, giving the Casa Grande community a place to heal with natural solutions. Chiropractic care and massage therapy combined can show you incredible results. Our practice philosophy is to treat everyone with respect, helping to take care of people’s health challenges in an honest and effective fashion. If we feel that we’re not the right place for you, you’ll be informed immediately and referred to the appropriate practitioner in our professional network. As we like to say, when your spine is aligned, you’ll feel fine! Chiropractic works naturally by alleviating pressure on your nerves. It’s a conservative option that doesn’t carry the risky side effects of drugs and surgery. We may recommend the use of physiotherapy modalities in your care, helping your body ready for an adjustment. Dr. Riordan also offers physical therapy that may be appropriate in helping you heal. We accept insurance, including Medicare, and are in-network with several plans. Evening hours are available to stay flexible to your schedule. Book your appointment with us today!